Star-Ting Incorporated’s service lines complement your decision-makers with a streamlined process to save you time and money. Make stronger risk-informed decisions with our system, RESP-ROI® where by shrinking and managing the degree of error in subjective reporting, the reliability of the data is increased. This optimal solution is for governance, operations or major projects. Finance, Operation, Project or Strategic Insights – incorporated with a stronger focus on operational improvements in manufacturing, production, purchasing, inventory management, and sales from micro and/or macro-environment perspective. Director’s and Officer’s Liability (D&O) – better identification of vulnerabilities in published documents or other narratives that can significantly reduce regulatory exposure or better support pension governance. Governance and Risk Compliance – meet regulatory requirements and submission activities for energy, petroleum, manufacturing, oil and gas as well as water resources. 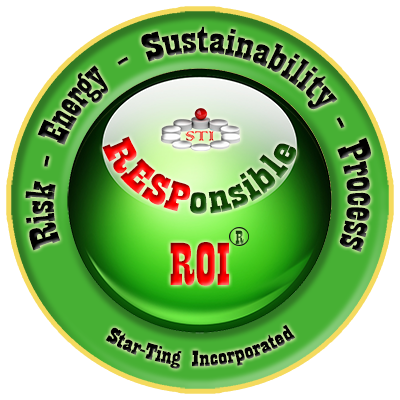 Incorporating “RESPONSIBLE RISK MANAGEMENT®” with the “RESP-ROI®” approach ensures that risk controls and decision-making outcomes are based on evidence rather than group-think or best-guess. Don’t rely on out-dated analytics that do not include the ability to “quantify qualitative™” data. Increased coverage increases accuracy. Don’t make 100% of your decisions on 50% inputs. Instead, order a RESP-ROI® Intelligence Report for robust decision making and support.